Mobile has become an integral part of the shopping experience as consumers spend more time with mobile devices than with desktop and notebook computers combined. In fact, mobile accounted for USD 1.2 billion in sales on Black Friday 2016, a 33 percent increase from the previous year, according to Tech Crunch. Mobile has become so pervasive that having a retail mobile strategy is essential. By some estimates, mobile now comprises 30 percent of all US e-commerce, reaching USD 100 billion in total sales in 2015, according to Internet Retailer. Yet there is still room to grow. According to the Forrester US Mobile Phone And Tablet Commerce Forecast, 2015 To 2020, while nearly one-third of retailer web traffic is from mobile devices, only 11 percent of sales come from mobile. Thus, we have a growing trend of customers shopping with their tablets or phones, and still more potential from shoppers who have a mobile device and haven’t explored the full benefit of engaging with retailers whenever and wherever they choose. Mobile can give retailers access to new consumers: they can tap into anytime and anywhere, and convert them into loyal, consistent mobile customers by allowing them to shop on their terms. Mobile can enrich and engage customers in deeper experiences that drive loyalty across a number of touchpoints, including the point of sale, checkout and with multi-channel CRM engagement. For example, research from IBM shows that 58 percent of customers who encountered mobile-equipped retail staffers found that it enhanced their in-store experience. Yet, a study from IBM Institute for Business Value finds that 84 percent of brands do not offer any in-store mobile services. Mobile can also assist retailers in closing sales on out-of-stock items. Few in-store buying experiences are more frustrating than an out-of-stock item. Mobile-enabled stores are converting some 68 percent of out-of-stock incidents into potential home-delivery sales, according to IBM. In this case, both retailers and shoppers come out winners with mobile. Legacy retailers are cutting back operations and retrenching strategy and workforce. This won’t, by itself, change the game. As the game evolves to second-screen shopping in front of the TV, and building online and in-store destinations that provide personalized experiences. So how can enterprising retailers get started fast? Digital reinvention is experienced through mobile. Mobile has become the device of choice for purchasing apparel and accessories, which now accounts for over 60 percent of time spent shopping online, according to Retail Dive. The retailer front shop window is now, for most, the screen of their mobile device.Another mobile technology, augmented reality, also has incredible potential to change the shopping experience and offer memorable branded experiences. Despite the obvious potential of these technologies to continue to grow, Retail Dive estimates only 16 percent of all retail dollars are invested in new mobile capabilities. It is not too late ­— great retail capabilities are available with ease and security. You don’t have to build from scratch to create that unique experience that keeps customers coming back. Unique and secure capabilities around in-store sales support, order commitment, dynamic buying, payment and in-store inventory management are available and can be implemented quickly to create your retail mobile strategy and improve client engagement.The latest 2017 findings from the IBM Institute for Business Value global study on mobile and emerging tech shows that only three percent of global retailers do not have dedicated mobile strategy teams, yet a full 42 percent still report that they are not any more innovative than their peers. Thus, equipping those teams with easily modified off-the-shelf capabilities and security-proven modular application development tools may be the answer to accelerate and differentiate mobile innovation for many retailers in the short-term. Augmented Intelligence as a personal shopper of the near future. While time spent shopping has been decreasing, One Poll estimated that women can spend on average around 400 hours a year shopping, including about 1.5 hours a week grocery shopping specifically. Much of that time can be attributed to seeking the best price and product. But what happens when we provide a learning assistant with our preferences which is always vigilant for the best price and product on our behalf? Well, we will soon find out because it’s coming.The next wave of shopping change is already on the way, and it will be led by augmented and artificial intelligence. According to the IBM Institute for Business Value, 83 percent of retail executives familiar with cognitive computing believe it will have a critical impact on the future of their business, and 91 percent of execs think it will disrupt the status quo. 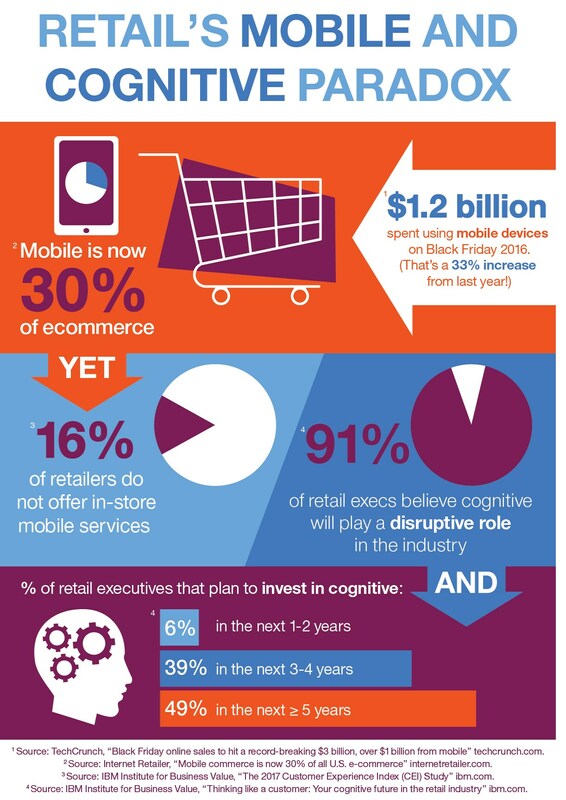 While retail executives believe in the impact mobile and cognitive computing will have, investment has not yet followed that belief, with only six percent of those same execs investing in it during the year, and 40 percent planning to invest in the next three years, according to that same IBM Institute for Business Value report. It’s important to point out that mobile and artificial intelligence are complementary investments. Tapping into artificial intelligence will be through customers’ mobile device of choice. The level of disruption and change is daunting, but as in all major business inflection points, victory will go to the swift and the bold. As a retailer, you need to act and invest now to stay relevant and lead your marketplace. The capabilities are already available for your retail mobile strategy; they just await the pioneers that want to lead the next wave of innovation and reinvention.